Laparoscopic liver resection (LLR) has been covered with medical insurance by Japanese government since April 2010. LLR can be expected to expand as standard hepatic resection. Standard technique and surgical training system have to be established because rapid expansion might cause fatal complication. We report the current status of LLR in our institution and propose a new classification of LLR based on technical demand for surgical training system. Patients undergoing LLR in our institution between Sept. 2002 and Oct. 2010 were included. LLRs were divided into 3 groups of consecutive periods and the method of parenchymal dissection and outcomes were compared. 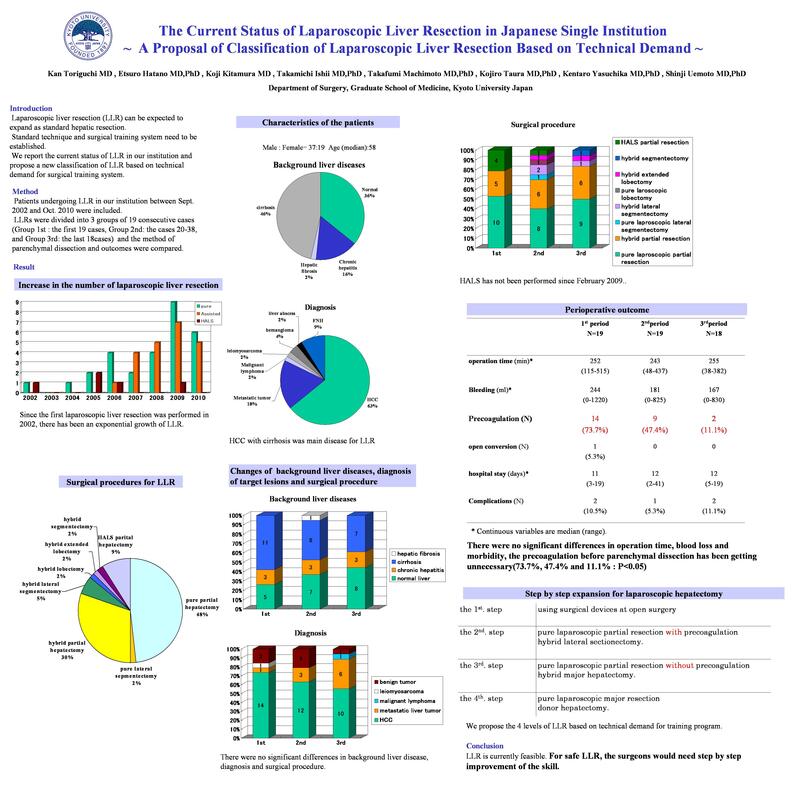 LLR was performed in 56 patients by the following procedures: pure laparoscopic partial resection (48.2%), hybrid partial resection (30.3%), hand assisted partial resection (8.9%) ,hybrid lateral sectionectomy (5.4%), hybrid major hepatectomies (5.4%). The morbidity rate was 8.9%. There was no serious complication. The conversion rate was 1.8%. These results were similar to that of questionnaire survey conducted by the Japanese endoscopic liver surgery study group. Among three groups, there were no significant differences in operation time, blood loss and morbidity. The precoagulation method before parenchymal dissection has been getting unnecessary (73.7%, 47.4% and 11.1%: P<0.05).We propose the following 4 levels of LLR based on technical demand for training program. The 1st. step includes the training by using surgical devices at open surgery. The 2nd step includes the pure laparoscopic partial resection with precoagulation and hybrid lateral sectionectomy. The 3rd step includes pure laparoscopic partial resection without precoagulation and hybrid major hepatectomy. The 4th step includes pure laparoscopic major resection and donor hepatectomy. LLR is currently feasible. For safe LLR, the surgeons would need step by step improvement of the skill.